Sean Kelly congratulates Idris Khan on his commission to create the British Museum’s first site-specific artworks as part of the new Albukhary Foundation Gallery of the Islamic World, opening on October 18, 2018. Idris Khan created 21 Stones, an installation of twenty-one unique paintings, in direct response to the British Museum’s extensive Islamic world collection. The installation will be hung on a dedicated display wall. 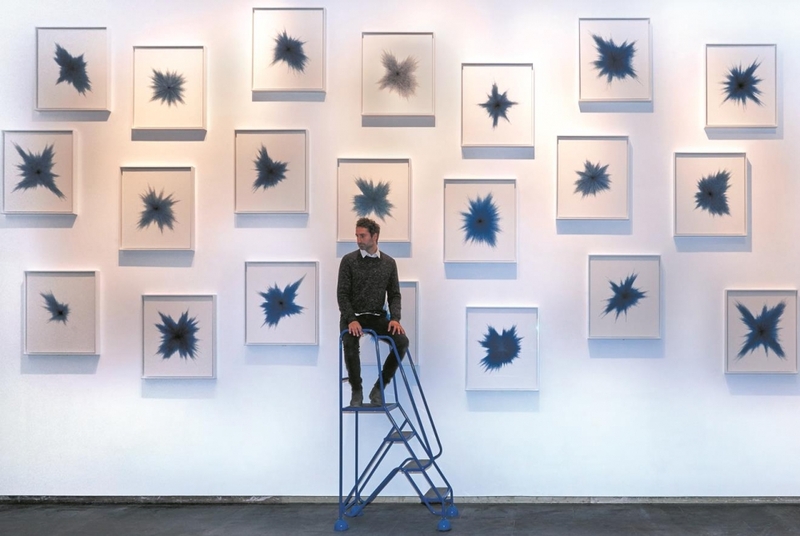 Each individual work is made with a unique piece of poetry, stamped with blue oil paint on paper mounted on aluminum using a new archival process. This acquisition has been supported by the Contemporary and Modern Middle Eastern Art acquisition group (CaMMEA). Khan’s 21 drawings are based on The Stoning of the Jamarat or ‘Stoning of the Devil’ a ritual that takes place during the annual Islamic Hajj pilgrimage to the holy city of Mecca. In this ritual, pilgrims nowadays throw the stones at a single wall which represents the original three pillars of the Jamarat. Each drawing representing a stone thrown, and the words hitting the paper re-creating the energy of the experience in Mecca.